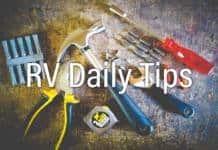 This newsletter is brought to you Monday through Thursday by RVtravel.com and is funded primarily through voluntary subscription contributions from our readers. Thank you! Sometimes as RVers we aren’t sure of what gear to carry. After all, there’s only so much space in the rig – being piled from floor to ceiling isn’t conducive to moving about freely. But there’s one thing you may want to carry more than one of: a water hose. Keeping a long water hose in the rig is always a given, particularly if you frequent RV parks with hookups. But a short coupled water hose, just a few feet long, can make life a whole lot easier when on the road. We’re accustomed to lots of boondocking, meaning we’re away from hookups for days, even weeks at a time. Pulling into an RV service station to dump tanks and take on water is something we just work into our trips. In National Parks, it’s not uncommon to find those tall, tower-like water stations, where a hose hangs above the ground, supported by a spring structure that keeps the hose off the ground, yet easily accessible for use. Not so on one of our park stops. Here were the towers, but no hoses. Happily the rangers had left a rope tied to the towers so you could pull down the “business end” of the tower. Here we could pull the connection down close enough to the ground that we didn’t need a rinse hose at all – we just directed the jet of water into our sewer hose to rinse it out. But when we got to the tower for potable water fill, well, that was a different story. We’d left our “short” six-foot fill hose back at base and found ourselves stuck dragging out the long hose, hooking it up, then after the fill, blowing the water out of 25 feet of line and wrapping it all up. There are times, too, even when the potable water station provides a convenient hose, you may be better off using your own. Some folks, for some perverse reason, insist on using the available fresh water hose to clean their sewer hose. If in doubt, disconnect the available hose, maybe even clean the tap threads with sanitizer, and use your own. A tank full of bad bacteria will make for a memorable RV trip, and using your own “known clean” hose can pay dividends. Read yesterday’s tip: 12-volts DC can be dangerous too! IF YOU APPRECIATE THIS NEWSLETTER and others from RVtravel.com, will you please consider pledging your support? Even $5, $10 or $20 is appreciated. Many readers set up an ongoing contribution, typically $5 to $10 a month. Your contributions make it possible for us to produce 25 highly informative newsletters every month. Learn more or contribute. The Boulder Tools Tire Repair Kit is the premium flat tire repair kit available on the market for repairing tubeless tire punctures including those on RVs.The easy-to-follow instructions mean anyone can plug their flat tire in minutes. Built with the strongest materials and contained in a sturdy, portable case, this is the last kit you will ever have to buy. Learn more or order. Inveterate bookworm but looking to conserve power? A “Kindle” or other e-reader device with backlight doesn’t need much ambient light to read at night. During the day, plug it in and recharge it while driving. Safety glasses are highly underrated and underused. Anytime you’re working on an RV’s electrical system, especially the 12-volt house batteries, you should wear a pair. It’s possible to squirt sulfuric acid out of the battery vents and cause instant eye damage. Also, if you’re climbing around under your RV you can easily have something drop into your eye and cause severe damage. Get a nice pair of safety glasses that have a case to keep them from getting scratched up, and wear them when working around anything that could get close to your eyes. I’ve had a few eye operations myself and it’s not comfortable at all. I recommend these. Worried about counter drop leaf dropping? If you’re worried your counter extension drop leaf may “drop” at the wrong time, get a short-length shower curtain rod and use it for extra support. Simply put one end of the rod on the floor under the leaf and rack out the rod until it firmly supports the leaf. Exercising your generator with a load. The U.S Army Corps of Engineers manages more than 12 million acres of land and water nationwide. In fact, it’s the largest federal provider of outdoor recreation in the nation. This book will guide you to more than 600 Corps-managed campgrounds with sites suitable for RV camping on nearly 200 lakes around the country. Many RVers believe Corps campgrounds are among the best out there! Learn more or order. If you have a long day of driving ahead, consult Roadtrippers! Plug in your starting and ending points and the website will tell you everything you should do along the way! Discover new routes, restaurants, places to stay, photo opportunities and much more. Wonder if that place you’re going is dog-friendly? Wonder no more. Bring Fido shows you every place (it’s a huuuuuge database) that you can bring your pup. See if you can bring him to the restaurant on Friday night, see where the nearest dog park is, or even see if he can come to that upcoming wine festival you have your eye on. Tell Supercook what foods you have in your fridge and pantry, and it’ll pair you with recipes that include those items. Great for those nights you don’t know what to make and don’t feel like going to the grocery store. Supercook does all the hard work for you (minus the cooking…we wish!). Put your life in order with this valuable new resource from AARP and the American Bar Association. Checklist for My Family guides you through the process of gathering in one place your finances, legal documents, online accounts, wishes about medical care, and more. Plus it tells you what you need, why you need it, what’s missing, and where to get it. Learn more or order. Bob Livingston and Bill Gehr from Trailer Life show you the easy process of replacing a plastic RV roof vent. A few simple tools, a trip to the RV parts store for a replacement vent, and you’re set to go. The video runs about four minutes. CLICK THE VIDEO TO SEE THE TIP. See all of our videos on our YouTube Channel. If you’ve ever tried to install a magnetic mount-style antenna on an RV’s rubber roof, you know it just won’t happen. A piece of galvanized metal – for example, an electrical junction box cover – is a great “base” for such antennas. How to attach it? One reader screwed his down to the roof, using roof-compatible sealant under it. Others have used heavy-duty double-stick tape to hold the plate down. Do you have a tip? Send it to diane (at) rvtravel.com . Join us: On RVillage • Facebook • Twitter • YouTube. SIGN UP FOR THIS OR ANY OF RVTRAVEL.COM’S NEWSLETTERS. Pot of Gold. Did you win? Here are today’s Zip and Postal Codes. If you’re the winner, let us know immediately. If you are, you’ll win $72. Good luck! Editor and Publisher: Chuck Woodbury. Managing editor: Diane McGovern. Staff writer: Emily Woodbury. Contributing writers: Russ De Maris, Bob Difley, Gary Bunzer, Roger Marble, Deanna Tolliver, Mike Sokol, J.M. Montigel and Andrew Robinson. Advertising coordinator: Gail Meyring. Next articleWhy is my propane tank humming? Call me crazy but are all the jacks of equal length? Nothing would surprise me these days. It’s hard to determine just what your problem is from your description. I would suggest you find an old rv veteran at the park where you are to consult. I would also suggest you go to the hardware store and buy a decent carpenter’s level. Ignore the factory level, and put the carpenter’s level on the floor of your trailer to get a truer reading front-to-rear and side-to-side. Kathey, without knowing if your site is way off level, then there’s no way to suggest what you might do. All of us have problems leveling from time to time, but it’s usually because the campsite is so far off level it’s hard to level up the rig.